Designed to enhance the nutrition of pasteurized milk with the addition of necessary vitamins and organic trace minerals. Balances the protein and fat in pasteurized milk to help ensure lean gain. 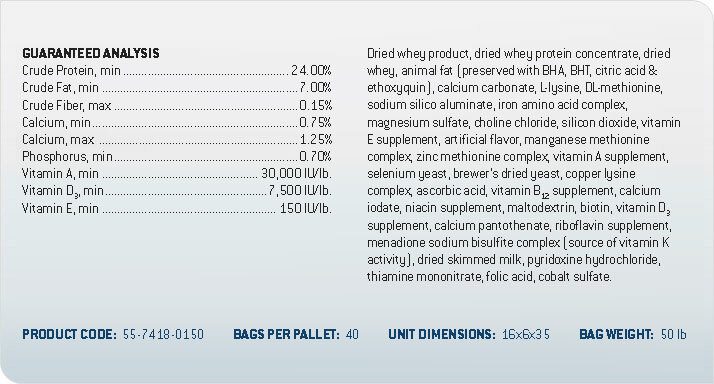 All-milk protein—contains 24% protein and 7% fat for optimal digestibility. This non-medicated formula allows a flexible feeding rate and provides consistency from feeding to feeding. Measure 1.5 quarts of pasteurized milk (105-115°F) into a clean bucket. Sprinkle 4 oz. (1/4 lb.) of BalanSure® powder onto the milk surface and mix thoroughly while adding warm water to the two quart level. For large batches, mix 5 lb. of BalanSure® powder to 7.5 gallons of warm pasteurized milk and mix thoroughly while adding warm water to the 10 gallon level. Feed twice daily.